Will 8300 Act as Support for Nifty this Expiry? You are here: Home / Futures and Options / Will 8300 Act as Support for Nifty this Expiry? Nifty and Bank Nifty futures on the hourly charts maintains the positional buy mode with the supports coming around 8327 and 17335 respectively. Reverse the strategy to positional sell mode if the support zone breaks on the hourly closing basis. India VIX turned to positional buy mode and we can expect a little bit of volatility in the market with a bullish sentiment and India VIX supports comes around 12.13 levels. Market might enter into the limbo mode if it breaks the support zone which generally hurts the naked option players. 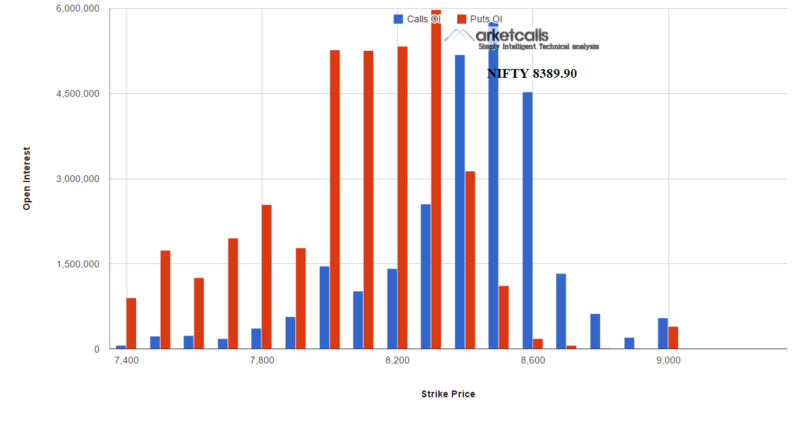 Currently after multiple flip flops in the higher open interest built up 8300PE is been in written heavily as the market sentiment oscillates in a sinusoidal fashion so far this month. Currently Option Players believe that 8300PE is the support zone for current month expiry.